Stretches for Musicians – Stay Healthy and Play Longer! It may not occur to people how important stretches can be for musicians, but they are necessary considering the repetitive movements and motor skills required for playing. Each instrument has unique demands it places on the body—repetitive finger movements for pianists, guitarists, and drummers, holding a flute upright in the correct position, the weight of a saxophone on a players neck and back, etc. I found these excellent stretches on www.MusicNotes.com and wanted to share them with you to keep you healthy and playing pain free! Do them before each practice session. Place your ear on your right shoulder. Gently and slowly press your head toward your shoulder with hand on same side, while keeping opposite shoulder relaxed. Hold stretch for 12 seconds. Repeat on other side. Place one arm straight across your chest while gently pulling it in toward your body with your opposite hand and hold for 12 seconds. Repeat with other arm. With arms relaxed at sides, gently shrug your shoulders up toward your ears. Relax and repeat 10 times. Extend arms straight out in front of your body, palms up, without locking your elbows. Bend and straighten elbows slowly. Repeat 10 times. To build strength, add 5 to 10 pound weights in each hand. Similarly, extend arms out to your sides without locking your elbows. Bring both elbows up so that your fingertips are touching at the back of your head. Return to sides and repeat 10 times. Place arms in front of you with your fingertips extended. Rotate palms up/palms down 10 times, then wrists up/wrists down 10 times. “Wave” by keeping arms in front with fingertips extended upward. Rotate wrists outward, toward your pinkie side, then inward, toward your thumbs, repeat 10 times. Still keeping hands out in front, extend your fingertips straight forward with palms down. Gently pull your fingertips from the top, toward your body, with your opposite hand until you feel a healthy stretch in your wrist, hand and fingers. Hold for 12 seconds then repeat with other hand. Next, do the same, only pull fingertips downward toward your body. Hold for 12 seconds on each hand. Spread fingers on both hands out as far as you (comfortably) can, then squeeze into a moderate fist. Repeat 10 times. Bend finger joints as if you were gripping handlebars, then spread out. Repeat five times. Gently shake out your hands. Enjoy! Stay Healthy and keep playing! 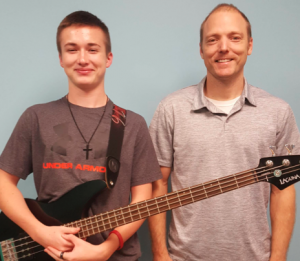 Troy has been taking bass and guitar lessons with Matt Crandall for one year. He is in the Tuesday Rock Band with Mike English. He’s a fantastic musician with a great attitude! What’s your musical background? I started playing trumpet in 5th grade, then about 2 years ago my grandpa gave me a bass for Christmas. A little after that I picked up guitar… And I play piano too. What’s your favorite thing you’ve worked on in lessons so far? I like to play 12 bars blues and just jam and have fun. Great job, Troy! You’re a fantastic musician.